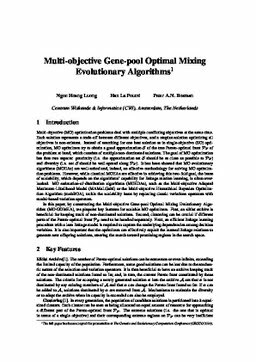 In this paper, by constructing the Multi-objective Gene-pool Optimal Mixing Evolutionary Algorithm (MO-GOMEA), we pinpoint key features for scalable multi objective optimizers. First, an elitist archive is beneficial for keeping track of non-dominated solutions. Second, clustering can be crucial if different parts of the Pareto-optimal front need to be handled separately. Next, an efficient linkage learning procedure with a lean linkage model is required to capture the underlying dependencies among decision variables. It is also important that the optimizers can effectively exploit the learned linkage relations to generate new offspring solutions, steering the search toward promising regions in the search space. Luong, N.H, La Poutré, J.A, & Bosman, P.A.N. (2014). Multi-objective gene-pool optimal mixing evolutionary algorithms. In Proceedings of Benelux Conference on Artificial Intelligence 2014 (pp. 159–160). BNAIC.